We’ve been kept busy remodeling/updating our new (to us) little farmhouse. It is little, but painting the outside makes it seem very large! So, haven’t been doing too much in-depth cooking. But, it’s been a bit rainy around here lately, so I’ve been able to play a little. Essentially, you toss chunked potatoes with Italian dressing which has a little chili powder added on a sheet pan and roast for about 20 minutes at 400°. Remove from oven and push to sides of sheet pan. Place chicken in single layer in center of pan (I used thighs); sprinkle with chili powder. Drizzle chicken with barbecue sauce. Bake 20 min. or until chicken is done and potatoes are tender. Transfer chicken to platter. Stir potatoes to evenly coat with pan drippings. Spoon around chicken on platter; top with Parmesan. My potatoes were crispy done earlier than the chicken, so I removed them from the oven until the chicken was done. Remove chicken to a plate and add the potatoes back to the sheet pan and toss them in all that chicken/BBQ goodness, then add to the plate with the chicken. Pat salmon dry using a paper towel.Cover a baking sheet with parchment paper or tin foil.Place salmon on covered baking sheet. In a small bowl mix mustard, maple syrup, salt, and pepper. Whisk until smooth. Brush the mustard maple mixture on salmon, reserved a small amount for glazing later. Bake salmon for 9 minutes.Remove from oven, brush remaining mixture on salmon. Bake for an additional 3-5 minutes until salmon flakes with a fork. So now I had all I needed to make the best salmon patties – I had 2 portions of salmon and 8-10 chunks (~1 1/2″ size) of potatoes leftover. Smash the potatoes and scrape all the ‘goop’ from the chicken pan plus any of the mustard/maple glaze into the potatoes. And gently add flaked leftover salmon. Add panko to make a consistency to form patties. 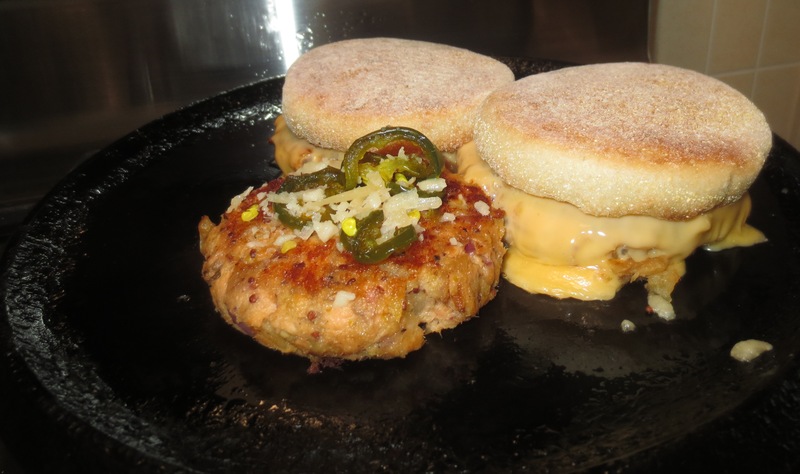 I cooked on a cast iron griddle one side until browned, then turn patties over and topped with 4 or 5 candied jalapeno slices and optionally (which I did), split one slice of American cheese and a sprinkling of Parmesan cheese. Loosely cover with a piece of foil and continue cooking until the cheese melts. I didn’t add anything to the toasted English muffin except a slight smear of deli mustard. I can’t tell you how much we enjoyed this sandwich! Now, back to the painting! !